This latest offering from the Citizens' Young Company allows the audience a glimpse into the secret world of teenagers on a night out. We join their search for the mythical 'Nighthawks' nightclub - where only the elite make it past the door staff. As with all youth/student or amateur productions we comment on, we make no concessions - if they look for an audience and charge for tickets we treat them all the same. So please keep that in mind when I tell you that this production absolutely rocked the Citz Circle Studio. Described in the programme as devised by professional playwright Peter Arnott and the Company and scripted by Arnott it perfectly captures several aspects of teenage life including the fleeting and shifting nature of friendships. The dialogue is blisteringly funny and rings entirely true to the characters created, but there's plenty of social comment here too - consumerism, families, restricted opportunities and a rumoured approaching apocalypse all feature. Apart from a few lines delivered into the floor that don't quite reach the audience, the performances from the large cast are all strong. In "The Lads' Tale" Chris McCann's Pan-like Wittgenstein impressively commands the space and plays his comic relief wonderfully straight while Scott McKay's Kevin is a bundle of frustration and disillusionment. Keren McGill effectively leads "The Girls' Tale" with a convincing performance as abandoned birthday girl Karen. Other highlights include James Harkness as local tough guy Gary and a deliciously show stealing turn by Kelly Love as the club's 'Lifestyle Consultant'. Neil Packham's direction keeps the action moving and there's some clever use of projection for a casino scene, but I'm not convinced that the soundtrack added quite as much to the piece as it could have. In a small theatre space it would be easy to dismiss the hugely enthusiastic response of the audience as one of invited family and friends but I don't believe for a minute that to be the case. This is a quality piece of writing, performed by a cast full of talent and energy - and it deserves a wider audience than this short run can give it. 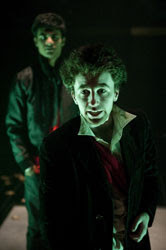 Citizen Y: Nighthawks completes its run at the Citizens on Saturday 11th April. Christopher McCann was amazing. he reminded me of Al Pacino and you could tell he was completely disciplined onstage. He stole the show. Arnott’s writing here was ludicrously witty. Loved the references to the Gorbals. 'deliciously show stealing turn by Kelly Love as the club's 'Lifestyle Consultant' a minor part compared to the rest of the actors and I disagree with her acting being a show stealing turn. she was awful. I was sitting in the front row on the Friday night performance and I couldn't make out what she was saying. There was a major lack of stage presence compared to some of the females onstage. The bad guys double act was also scarily believable . SO TRUE. I was involved in the show and I don't think this review gives justice to some of the actors onstage eg keira who played party girl with the ginger guy. yeah, that girl was rubbish. All the girls were greatm], girl who played the weird hippe was good, and the person in the club was amazing.